For those who know us, you’ll know that we loved the 1st Edition of the Mouse Guard RPG, so we’re very excited by this news. BOOM! Studios announced its Archaia Entertainment imprint will release a second edition of the award-winning Mouse Guard Roleplaying Game in April. The release will include both a hardcover rulebook and a box set edition. The Eisner Award-winning Mouse Guard comic is an all ages anthropomorphic epic fantasy series written and drawn by David Peterson. 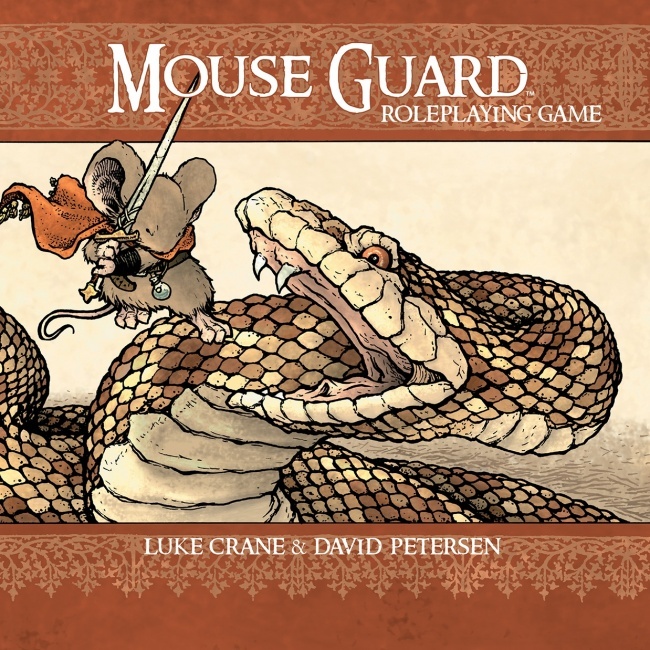 The RPG, designed by Luke Crane and David Petersen, was the winner of the 2009 Origins Award for “Best Role-Playing Game” (see “‘Pandemic,’ ‘Awakening the Bear’ Win ‘Origins’“), and Archaia released a box set in 2011 (see “‘Mouse Guard’ RPG Box Set“). The new Mouse Guard Roleplaying Game Box Set, Second Edition includes everything players need to know about the world of the Guard. The revised and update rulebook includes information for forming patrols and leading missions and features new art from David Petersen. Additional Action, Weapon, and Condition cards are also included. The box measures 8.5″ x 8.5″ x 2.5″. MSRP is $69.99. The new Mouse Guard Roleplaying Game, Second Edition hardcover is a 320-page, full-color, 8″ x 8″ volume. MSRP is $34.99.